News > NiSoft goes Titanic! 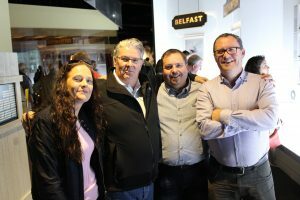 The sales folks at NiSoft from across the world have been putting their heads together this week in Belfast on all things strategic, revenue and marketing. 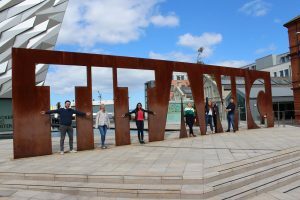 As a highlight to this event, our CEO Doug invited the entire office out to one of Belfast’s most iconic attractions Titanic Belfast. 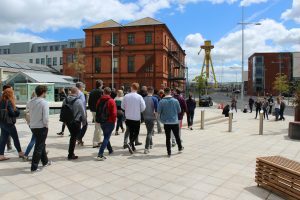 A great day was had by all as we learned about the conditions of working in a booming shipping industry in Belfast which saw the population triple over a very short period of time, whilst folks from all over the country flocked to Belfast to be a part of it. We were humbled to realise the conditions of how some of the great engineering work was completed, with nearly everything being moved, shaped, lifted, riveted and built by hand. The mentality of the workers and the dedication to making great things was really, really evident and is a challenge to us working in the software industry. They came in day in and day out, working 50+ hours a week in challenging (not to mentioned highly dangerous) conditions to put Belfast on the global map for engineering and shipbuilding. These men, who achieved so much are a great challenge to us to continue to keep Belfast on the map, and appreciate the lives and conditions we have in 2018.